This implementation of David Raup's parameter space for modeling shells is similar to the Demonstration contributed by Phil Ramsden. However, this model also allows for the manipulation of the shell thickness, a parameter potentially useful from a biological viewpoint. In certain species of snails, there is evidence that snail shell thickness correlates to the threat of predation from surrounding invasive species, such as crabs. 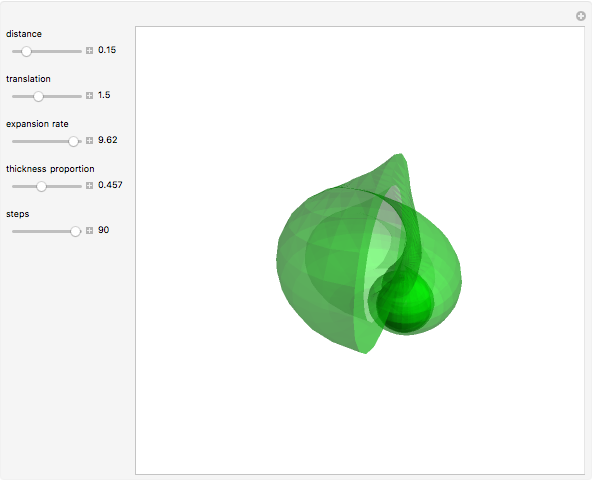 Snapshots 1–3: examples from parameters of the taxonomic groups Gastropoda, Ammonoidea, and Pelecypoda. D. Raup, "Geometric Analysis of Shell Coiling: General Problems," Journal of Paleontology, 40(5), 1966 pp. 1178–1190. jpaleontol.geoscienceworld.org/cgi/content/abstract/40/5/1178. 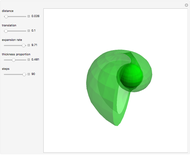 S. Urdy, N. Goudemand, H. Bucher, and R. Chirat, "Allometries and the Morphogenesis of the Molluscan Shell: A Quantitative and Theoretical Model," Journal of Experimental Zoology B, 314(4), 2010 pp. 280–302. 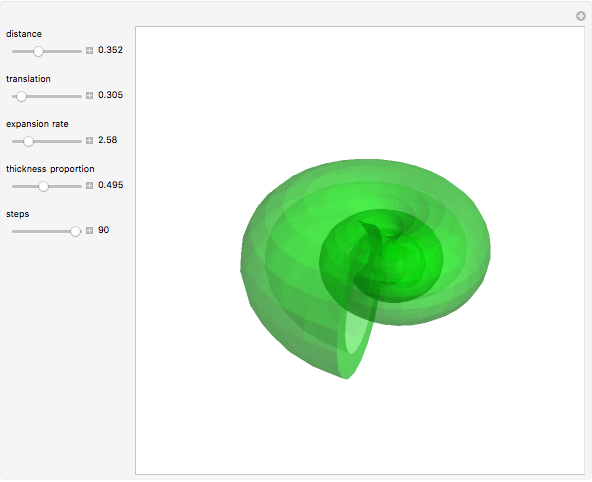 http://www.mendeley.com/catalog/allometries-morphogenesis-molluscan-shell-quantitative-theoretical-model/. G. Trussell, "Phenotypic Plasticity in an Intertidal Snail: The Role of a Common Crab Predator," Evolution, 50(1), 1996 pp. 448–454. http://www.mendeley.com/catalog/phenotypic-plasticity-intertidal-snail-role-common-crab-predator/. G. Trussell and D. Smith, "Induced Defenses in Response to an Invading Crab Predator: An Explanation of Historical and Geographic Phenotypic Change," Proceedings of the National Academy of Sciences of the United States of America, 97(5), 2000 pp. 2123–2127. www.pnas.org/content/97/5/2123.full. Jayna Resman, Michelle Winerip, Elizabeth Cowdery, and Allison Reed-Harris "Shell Parameter Space"